On October 1st, the Lamoille River, just below the Peterson Dam, was treated with lampricide, a pesticide, 3-trifluoromethyl-4-notrophenol, also known as TFM. Over the next two days, after the application of the chemicals, biologists surveyed the river downstream of the application site. In addition to numerous dead Sea Lamprey, over 500 dead mudpuppies were found. In the maintenance of aquatic systems, manipulations can be made, chemicals can be added to address a particular issue, but while addressing that specific issue, they may alter characteristics of the water that may subsequently cause other problems, which might not be obvious. Chemicals can act as environmental stressors, which, while they might not immediately cause mortalities, can compromise animals physiological condition and leave them susceptible to naturally occurring environmental pathogens (even in captivity) that otherwise healthy animals can endure. At ECHO, we avoid using chemicals in our aquatic systems. For example, we use Burlington municipal water in our aquatic displays. Burlington municipal water typically contains a chlorine level of 3-5 PPM (parts per million). At that level, it could kill many of ECHO’s aquatic and amphibious animal ambassadors. Rather than use sodium thiosulfate to dechlorinate, we aerate and circulate the water to accelerate the degassing of the chlorine. Once dechlorinated, usually within two to three days, the water can be added to ECHO’s exhibits. 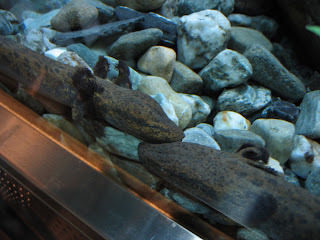 At ECHO, we maintain two exhibits of mudpuppies. With their aquatic lifestyle and their external gills, they are particularly susceptible to chemicals and changes in water quality. If we exposed them to chlorinated water or other chemicals, while we might not immediately kill them, the environmental stressor could compromise the mudpuppies ability to fend off pathogens. We would treat their symptoms, but If we didn’t determine our water quality issue, we’d wouldn’t eliminate the ultimate cause of the problem; we’d be unable to maintain a healthy population of mudpuppies. At ECHO when we treat animals for illnesses, we scrutinize our animal husbandry to ensure that we are providing the best possible environment for the collection. Nice job in addressing this topic. just wanted to say good job. I really enjoy reading your posts. I like waterdogs. I like them making noise.